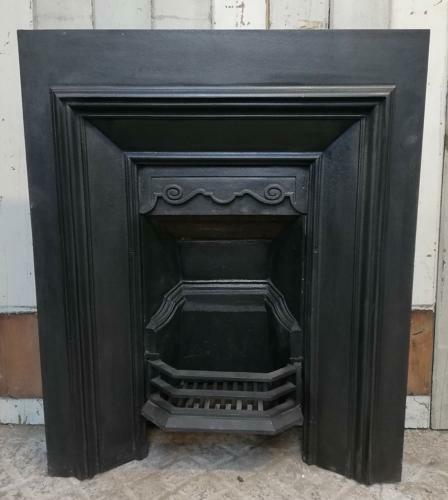 A stylish and attractive antique, square, cast iron fire insert. The fire has a simple and elegant design with a scrolling detail across the smoke hood and the legs have classic style borders. The fire's square shape is very popular at present and is suited to both a modern and period property. The fire is ideal for both a bedroom or living room. The iron has been blacked and polished and has an attractive finish. The fire has replacement front bars and a replacement top plate with an unusual design. The top plate has a face that sits within the fir eopening and some surface rust can be seen. The back has surface rust, as expected. The front has some light marks, knocks and scratches. The concrete fire back has some slight marks. The fire can be paired with a fire surround and would add style and character to a hearth. An attractive and useable fire insert.